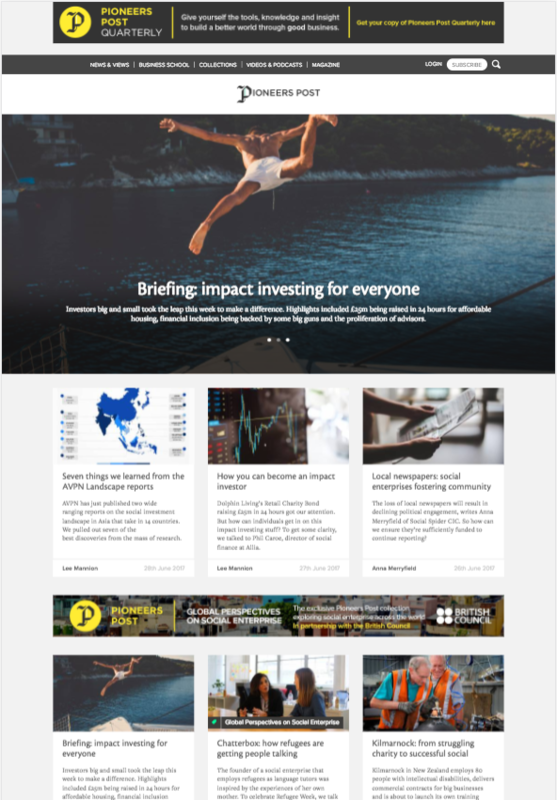 Pioneers Post delivers the news and sets the agenda for the new wave of responsible business leaders and social entrepreneurs. Their aim is to create intelligent and engaging content through news, analysis, comment, profiles, debate, specialist reports, the Pioneers Post Business School and our own online TV and podcast channels. Pioneers Post is itself a social enterprise, with clear social aims and profits ploughed back to support our community of socially progressive readers. Their community interest purpose is to inspire, nourish, support, promote and bring together the community of social entrepreneurs, social innovators and social investors across public, private and civil society sectors. Pioneers Post aim to build the success of social business, to promote shared value, social responsibility and sustainability alongside entrepreneurship, innovation and business excellence.